Left to Right: Eyelash Definer, Destiny Precision Angled Liner Brush, Divine Taklon Liner, Black Detail Synthetic, Synthetic Deluxe Crease Brush, Destiny Blender Brush, Sable Contour Brush. Left to Right: (starting at the duo fiber brush) Tapered Duo Fiber Brush, Bionic Flat Top Buffer Brush, Deluxe Duo Fiber Shadow, Black Blending Brush, Black Sable Lip Brush. 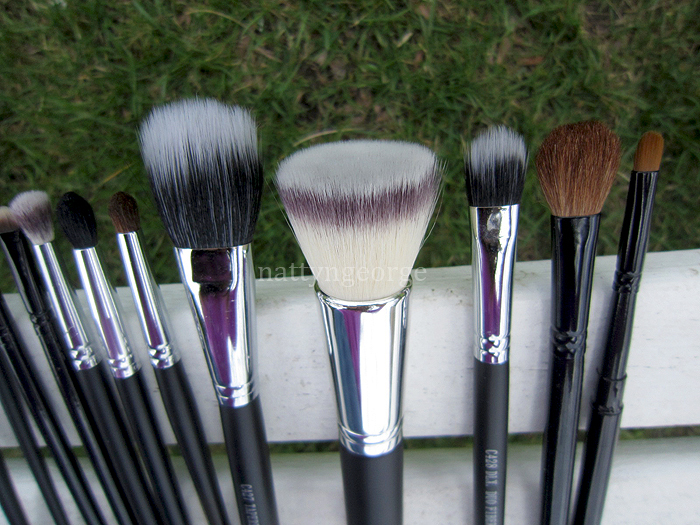 Coastal Scents Brushes are my favorite brushes next to Sigma Brushes. What I love the most about Coastal Scents Brushes, aside from the great quality, is the amazingly affordable price. Even less expensive than Sigma, most of their eye brushes range from $2 – $4. Their face brushes range from around $5, with the most expensive brushes being $15. To view all brushes, click here. The Bionic Flat Top Buffer Brush is becoming a new favorite of mine. I’ve used it the past couple of days for applying foundation, and it works really well. The bristles are incredibly soft, and because it’s fairly large, it takes half of the time applying my foundation than it would with a standard foundation brush. I was a little worried that it would soak up too much product, but it didn’t at all. Even after a few uses, the brush remained very soft. The Tapered Duo Fiber Brush is a dupe of the MAC 131 brush. I wouldn’t say it’s an exact dupe, as the MAC brush has better quality synthetic fibers, but the shape is the same and it also works well for applying foundation. I think it’s also a great brush to use for a cream blush and highlighting powder as the duo fibers don’t pick up as much product at once as a denser brush. The Deluxe Duo Fiber Shadow Brush. I’m pretty much a sucker for any “duo fiber” brush, so I thought I had to have this. Although it’s a shadow brush, I really like it for applying concealer and applying foundation in precision areas, such as around my brows. This is also a good brush to use for a brow highlight or a light wash of color on the lids. The Black Blending Brush was a little bit larger than I expected it to be and it’s not very dense. I personally like it for powdering my under eyes after I’ve applied concealer, and around the corners of my nose to prevent shine. It works very well for that. I do think it would work well to blend any harsh lines in your eye shadow application. The Black Sable Lip Brush is your standard compact lip brush with a metal lid for carrying around in your bag. I haven’t used it yet, but it will be handy for when I wear my OCC Lip Tars. The Eyelash Definer is something I think everyone needs. Plastic Lash Combs rarely ever do a good job of separating your lashes & clumps of mascara.. they moreso “comb” your lashes. Metal combs do a much better job at separating, as the teeth are thinner and come to a small point. I have a Tweezerman one for travel, but this is a good backup to have. The Destiny Precision Eyeliner Brush is a pretty decent brush for applying gel liner in very thin lines, and I even use it sometimes for my brows (see tutorial here). I ordered a backup because mine started to fray. The “Synthetic Fine Liner Brush” may be a better choice for a liner brush as the bristles are longer and may not fray as easily. The Destiny Precision Eyeliner Brush comes to a point, so it’s moreso for detail work. The Divine Taklon Liner Brush is a very good synthetic brush for applying liner and brow products. It’s fairly thin, so I haven’t had any issues with fraying of the bristles, which often happens with most of my angled brow brushes. The Black Detail Synthetic is a small brush for smudging shadow or liner to your lashline. Because the shape is a little bit rounded, it won’t create precision lines, which makes it a good tool for smudging or small details. The Synthetic Deluxe Crease Brush is a good brush for applying shadow to your crease. Also, because it’s synthetic, it would work well for applying cream shadow. Because it’s synthetic and dense, it will pick up lots of product, so it’s a good brush to use if you want a very dark crease. I actually like using it to apply concealer, as it’s a bit similar to the MAC 224, but shorter. It still works really well. The Destiny Blender Brush is again, very similar to the MAC 224, but has shorter bristles. I like it for applying shadow all over my lid and through my crease. The Sable Contour Brush is your standard “pencil” brush. It works very well to apply shadow through your crease, in the corners of your eyes, and even for blending/smudging shadow on your lashline. I am really pleased with all of my brushes, and I highly recommend all of them. Especially if you’re on a budget, or if you are looking to expand your brush collection. 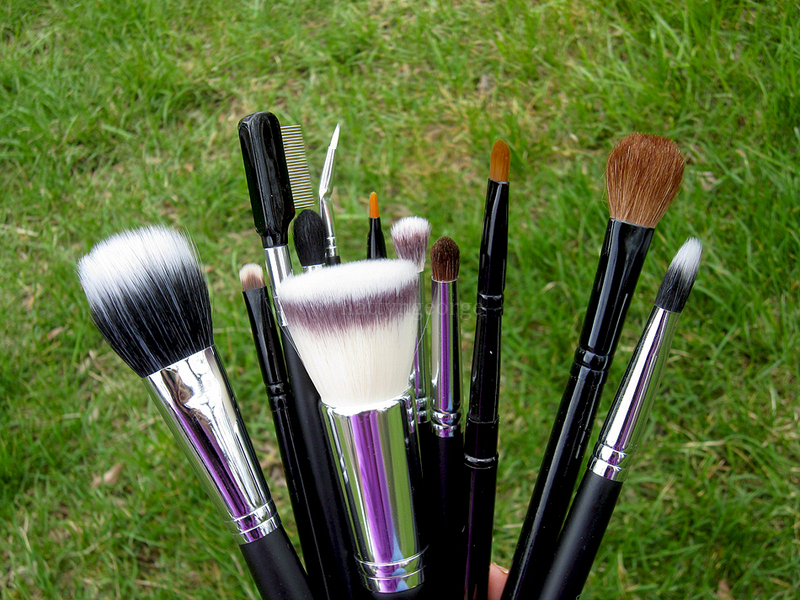 Do you have any favorite brushes or products from Coastal Scents? Share in the comments below! 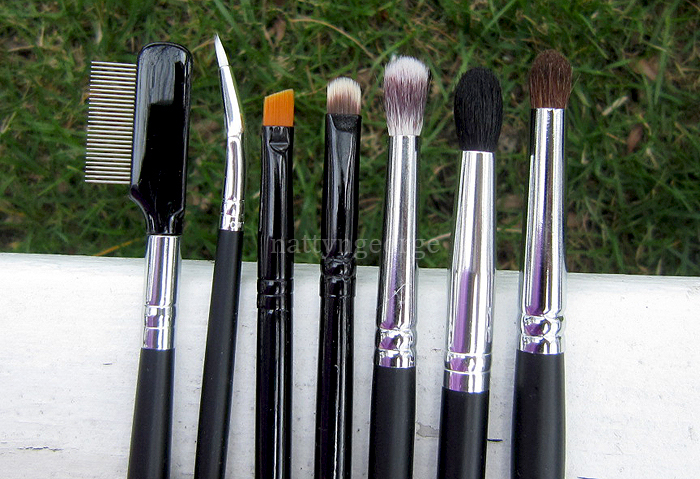 i have alot of their brushes as well and i love them, really good quality. The lash definer is love. i need to try that flat top buffer brush! I have a few CS brushes and I love them! You actually have one of my absolute favorites in this post and that's the Destiny Precision Angled liner brush 🙂 I cannot ever live without it, it's the perfect brush for applying gel liners in my opinion! I have the pink kabuki brush and pink taklon liner brush. Love the kabuki brush (mainly for the colour – I'm shallow LOL!) but the liner brush didn't last too long – the pink coating cracked on the handle…guess it became waterlogged and couldn't handle being washed too often (2-3 times a week). Ebru – I agree! The angled destiny is amazing! I mean, theres not much to it, but it works so much better than any other angled brush I've tried. I find it kind of similar to the ELF Studio Angled Brush, I like that one a lot as well. Rai – I noticed that a while back that they looked similar! Good to know, because I've always wanted to try Crown Brushes. The Bionic Flat Top Buffer Brush looks amazing! Do you think the sonia kashuk flat top brush is as good? I have about 3 or 4 brushes from CS and I love them all. I also love the synthetic deluxe crease brush for concealer – it buffs in my MUFE full cover like no one's biz! I also just bought their Deluxe Duo Fiber Shadow brush…excited to check that out!